The Lopi Gas Insert | 32 DVS Greensmart with Remote is perfect for heating small homes. 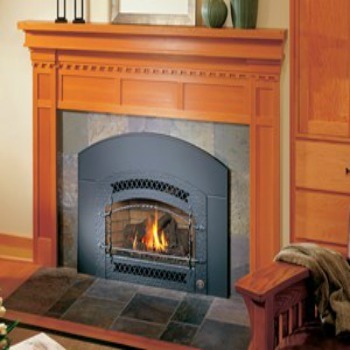 This is a Lopi fireplace insert that can heat up to 1,500 square foot area. This unit has many great features, such as the prize-winning Ember-Fyre™ burner technology and GreenSmart 2 handheld remote. Complete with powerful convection fans, which help distribute heat to other areas of your home. 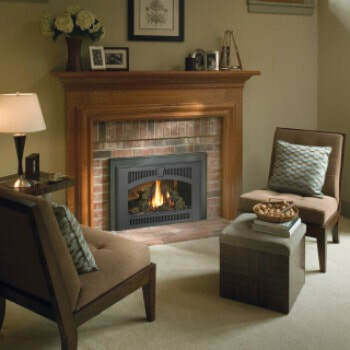 This unit also features ambient *accent lights that showcase the fireplace, regardless of if the unit is on or off. Customize the look and appeal of the unit with the Dancing-Fyre™ burner with your selection of log set or the Ember-Fyre™ burner and highly detailed log set. *Please note that accent lights are not available with the Driftwood Fyre-Art™ or Fyre-Stone™ Rock Kit. Venting: Dual Flex - 3" x 3"
﻿*All measurements and colors are approximate. Contact Bare's for details. Specifications may change without notice. Please note Bare's Stove and Spa strives to update manuals and information as they become available. These are for reference only; the latest documentation by the manufacturer takes precedence. Please visit Bare's for color options, dimensions and additional information. If the project is outside of South Western Montana please visit the Lopi site for dealers that may be near your area. Bare's may only sell these products bought and picked up from our store locations. Please understand we are unable to ship, sell, deliver, install, service or provide warranty for items outside of our area.